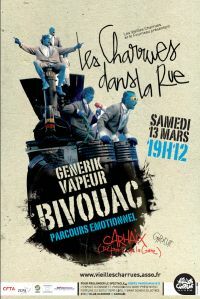 As part of the ZEPA projects and in the run-up to the show Bivouac in Carhaix (Brittany), the National Centre for Street Arts, Le Fourneau and the French street arts company Générik Vapeur will be training local people and volunteers from Les Vieilles Charrues so they can participate in the performance. This event is also the opportunity for Le Fourneau to invite its ZEPA British counterparts from Winchester and Great Yarmouth as observers of the training work towards local people, work which will also be developped by the company across the Channel. In partnership with Les Vieilles Charrues. More information on Le Fourneau website. Follow the reports of the ZEPA writers here.